(P1) In India, some teenagers have a game. This is a dangerous game. A fast train can hit them. (P2) An amateur video shows seven boys. They wait for a train. They are on a bridge. The train is coming at them full speed. 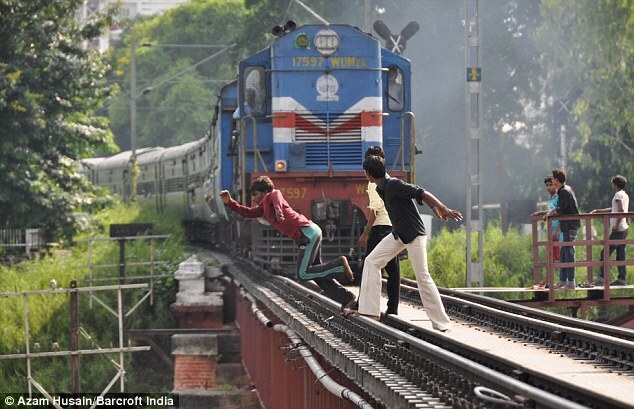 When the train is near them, they jump from the bridge into a river. The train almost hits them. (P3) Then they swim in the river. They are lucky that they are alive. Would you play this game? Why or why not? Do teenagers play dangerous games in your country? If yes, tell me about it. Why is this train game dangerous? Where do the teenagers live? How many teenagers are playing the game? What are the boys on? What do the teenagers do in the water?